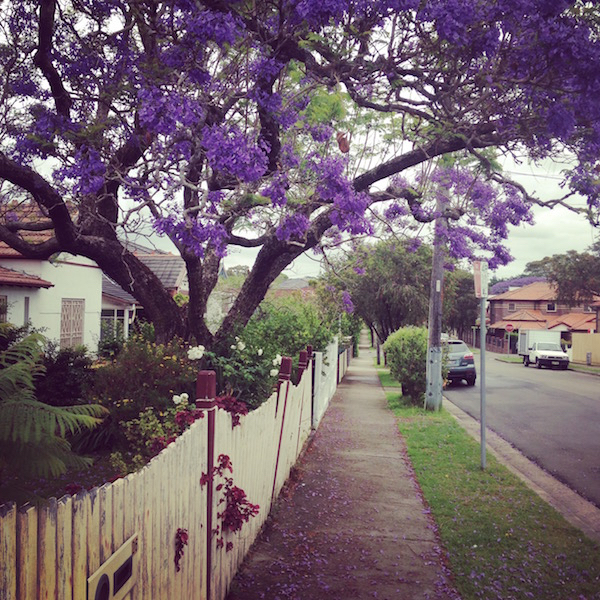 It’s spring in Sydney the jacaranda trees are in bloom and as always in November it can go from searing heat to wild, wet and chilly within a day. In the scenic hot spots round the city tourists are causing traffic chaos as they stand in the middle of the road to try and get the best shot of the purple blossomed trees. Who can blame them? The jacaranda trees in bloom are gob smackingly beautiful. It was my son’s birthday last week, I’m used to having big birthday parties for him but he requested a low key event this year and invited a couple of friends over for a movie then dinner. Without the need for mega event planning, I was at a bit of a loss. I made pizza and this cake and that was it! Because it was a quiet affair there was loads of cake left over to eat in the days after. 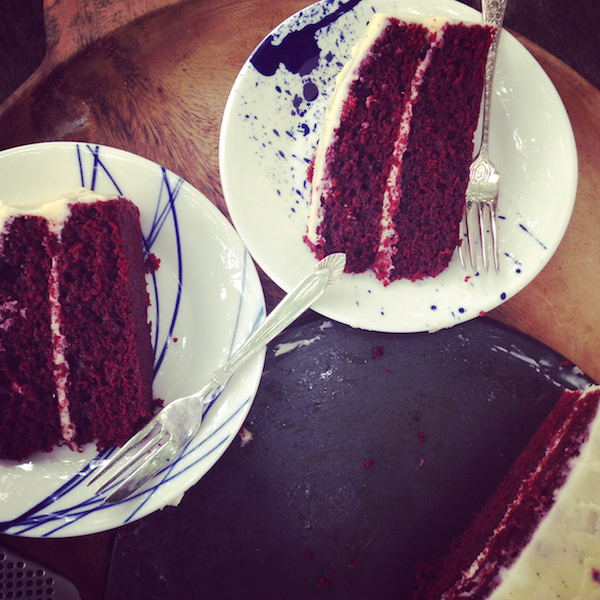 Luckily this red velvet cake tastes even better the day after when the flavors have time to mellow and the cake seems to become moister and more coherent. 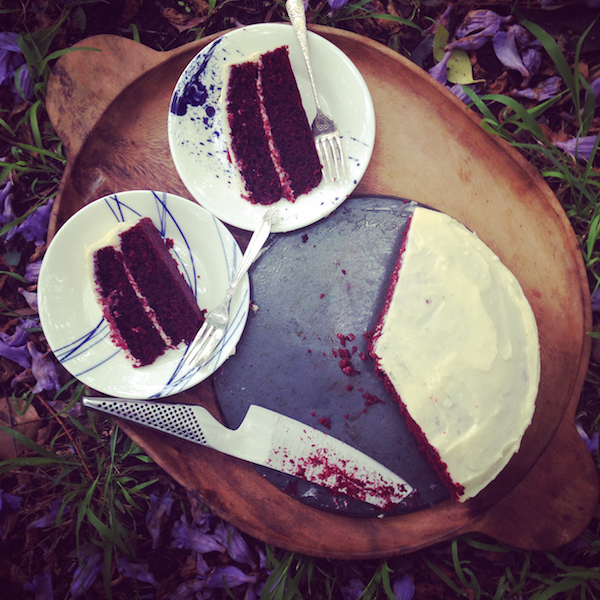 There are two styles of red velvet cake-oil or butter based. I prefer the oil based because the texture is more velvety and they tend to keep better. I’m a recent convert to baking with macadamia oil which I think is the ultimate baking oil with a buttery, nuttiness and along with some serious nutritional side benefits. My most favorite cake at the world at the moment is this, orange, yoghurt and cardamom cake, also baked with macadamia oil and like this red velvet cake, tastes even better after a day or two in the cake tin. The velvet cake is a little bit more complex to make involving the mixing of vinegar and bicarb soda as the raising agent which makes it slightly more nerve racking. This is a runny cake batter so it all seems a little bit dubious as to whether it rise or fall flat in the tin? There’s also an eye boggling amount of red food coloring (yes it really is four tablespoons). I always seem to end up with blotches of red cake batter on me, no matter how careful I am. You could dial the food coloring back a bit but I figure if you’re going to make red velvet cake you should go for broke and make it RED. That’s part of the magic of this cake, it’s not about restraint. This a cake for parties and celebrations both big and small. Notes on recipe – Take care not to overcook this cake as it is quite delicate and will become dry. This amount of cream cheese icing gives a good coverage over for a two layer cake but if you’re all about the cream cheese icing you may want to increase it. If you are a fan of the butter based red velvet cake this one from the Lee Brothers Southern Cookbook is stupendously over the top and glorious. Heat oven to 175 C (160C fan forced) or 350 F. Put teaspoon of butter in two 23cm cake tins. Place in oven until butter has melted, brush tins with melted butter and line bottom of tins with baking paper. Beat together sugar and oil in bowl of electric mixer until well blended. Add eggs one at a time and beat until combined. Turn machine to low and slowly add red food coloring and vanilla essence. Add flour mixture alternatively with buttermilk in two batches. Scrape down bowl and beat until mixture until combined. Mix together vinegar and baking soda in small bowl add to cake mixture while machine is running and beat for 10 seconds. Divide batter between pans for 40 to 45 minutes or when cake tester comes out clean. (take care not to over bake) Cool in tins for 20 minutes. Gently flip cakes onto cooling rakes, remove baking paper and allow to cool completely before icing. Beat cream cheese and butter together until combined. Gradually icing sugar and vanilla beat until smooth and fluffy. If icing is too runny let cool in fridge before icing cake. For red velvet cake unless you want crumb smears in your finished product it’s almost essential to do a thin ‘crumb’ layer of icing so you don’t have bright red crumbs messing up your final product. When the cake has completely cooled, ice the two layers together then layer a thin smear of icing all over the outside. Place the cake in the fridge for half an hour to set, then ice outside of the cake with your final layer of icing. What a lovely special occasion cake! On the couple of occasions that I’ve eaten red velvet at cafes, I’ve thought that it’s nowhere near as good as home-made.